The name Whiteline Disease (WLD) is a complete misnomer! Firstly, it is not a disease and secondly it does not affect the Whiteline. Whiteline Disease is actually an infection of the white inner wall of the hoof, the jury is out as to whether this is a bacterial or fungal infection, or even a mixture of both. Whiteline Disease shows first as thin black lines in the ground surface of the inner wall (see right). Ultimately, large sections of inner wall can be eaten away, leaving a deep crevice filled with a grey, ash-like material(second picture). The ash-like material is the remenants of the hoof wall that have not been eaten by the microbes. This level of damage often occurs in laminitis cases, especially the chronic low level cases, probably due to the poor quality of hoof horn being produced by these horses. 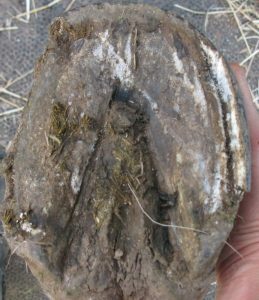 If a hoof is healthy and has strong walls, the bacteria or fungus that are found in WLD cases can not invade the hoof horn and cause damage, however if the wall is damaged already due to (for example) laminitis, poor hoof balance or incorrect nutritional balance the bacteria or fungus can then invade the horn and literally eat the wall away. At first, WLD does not cause any major problems to the horse, but if left untreated can lead to a weakening of the hoof capsule or abscessing within the hoof due to the compromised structure of the hoof capsule. Large chunks of wall may also get snapped off, as can be seen on the left of the second picture. The old saying “prevention is better than a cure” holds true with WLD. Finding the cause of the problem and fixing that will fix the WLD but this is a long term solution because healthy horn has to be grown from at least the top of the white line (which takes about 3 months) or even the top of the hoof capsule which may take 9 – 12 months. In the meantime, it may be necessary to topically treat the problem, to prevent too much damage to the hoof capsule. The are lots of remedies in your local tack shop that are sold to treat hoof problems, but a lot of these are way too strong for the job and can actually cause further damage to the hoof wall by drying it out or damaging the molcules that hold it together. In my experience, soaking the foot in a weak solution of baby steriliser fluid once or twice per week is sufficient to kill the troublesome microbes that are attacking the horn, I would follow this up by packing the hole with a zinc oxide based paste, possibly mixed with cotton fibres to help hold it in place . In mild cases, zinc oxide based pastes alone can be helpful. 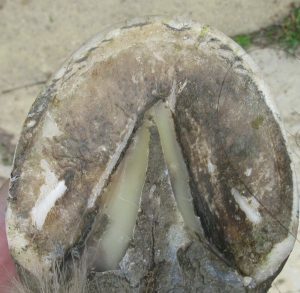 Seedy toe is similar to whiteline disease, in that it is a bacterial or fungal infection of the hoof wall, however the term Seedy Toe is used to describe a very localised infection, that often appears in the absolute centre of the toe (see picture right), as well as being localised, if the seedy toe recovers then recurs at a later date, it is likely to be in exactly the same place as before. You will often see a deformation of the white line around an area of seedy toe. As with white line disease, the hoof wall needs to be damaged in some way for the microbes to take hold, this damage may be in the form of stone penetration, an existing wall crack or other wall defect. The cause of seedy toe is often not just poor hoof balance or stone penetration. Sometimes, there can be a deformity known as a crena (a small notch) that affects the border of the pedal bone. This notch causes the laminae to grow at unusual angles and weakens the bond between the sensitive and insensitive laminae, leading to a weak spot at ground level in the inner wall, that can then be damaged by stones, weakened by periods of wet and dry or attacked by bacteria or fungus. As with WLD, topical treatment has a part to play in recovering Seedy Toe, but treating the cause can be more tricky. As a topical treatment I have found that cleaning out all of the dirt and hoof wall remenants, then stuffing the hole with a zinc oxide based product containing some cotton fibres to help it stay in place is very effective in preventing the infection from penetrating deeper into the hoof and is especially useful at helping to close cracks that are forming around the seedy toe. A soak in a dilute baby sterilising fluid may also be beneficial prior to packing the hole. If the seedy toe has taken hold around a crack in the hoof wall, or has formed following stone penetration then a balanced trim along with topical treatments may be sufficient to resolve the issue. As previously mentioned though, some cases of seedy toe occur due to a hoof wall defect leading to weaker horn. This less dense horn allows bacteria to penetrate into the hoof wall and shows up as seedy toe. In these cases, it is often not possible to completely resolve the seedy toe, but good hygiene, a balanced trim and topical treatments as required can help to minimise the damage caused to the hoof wall.